Scot Paul di Resta was 10th for Force India on his debut. He finished 12th but the two Saubers were disqualified for a technical infringement. Hamilton hailed his second place as a great achievement for McLaren after the team's poor performance in pre-season testing. 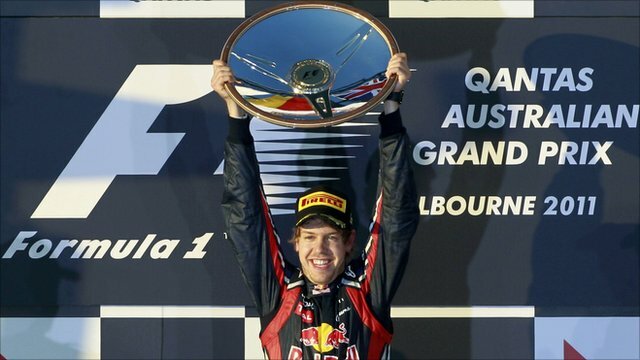 Vettel had already built a 2.6-second lead at the end of the first lap while others toiled behind him. Button found himself down in sixth after losing position to Ferrari's Felipe Massa and Petrov, who had brilliantly nosed his Renault up from sixth on the grid. As the race developed Button tried time and again to pass Massa, activating the moveable rear wing designed to aid overtaking, but the Brazilian defended strongly and Button was left asking his team over the radio; "How's he getting away from me?" There were more headaches to come for Button when he cut a chicane in an attempt to pass Massa and was subsequently handed a drive-through penalty. "There's no question that he gained an advantage," said BBC analyst David Coulthard. "He knew that two doesn't go into one around that curve. He had to go off track and had to pay a penalty for that." Button had a stab at holding up Vettel - who had pitted for the first of his two stops to leave Hamilton at the front for McLaren - before serving his penalty but the German soon flew past him and comfortably resumed his lead when Hamilton came in. After his stop-go penalty Button fed back in 12th but he crossed the line in sixth after what Brundle described as an "adventurous race". Despite Button's busy day, he and team-mate Hamilton will be relieved that McLaren's hard work at their Woking factory to turn a winter marred by a lack of pace and unreliability into a competitive start to the campaign. Hamilton managed his race well and took his car across the line for second despite warnings from his team that his car was damaged. It quickly became evident the undertray and floor of the car was broken, which as Hamilton pointed out afterwards, badly affected the amount of downforce. "We were clearly catching Seb earlier in the race, but in the end I was simply trying to nurse the car home," Hamilton said. Renault proved they had taken a step forward over the winter, in part thanks to their innovative car design with its front-exiting exhausts, as Petrov collected third place with a cool drive. The Russian repeated his trick from the season-ending Abu Dhabi Grand Prix by holding off the looming Alonso. Robert Kubica was second for Renault at last year's race in Melbourne and Petrov's performance suggested he is fully capable of leading the team on the track in the absence of Kubica, who is recovering from serious injuries in a rallying accident. "I'm very happy to be alongside Sebastian and Lewis on the podium, but from first practice the car has looked very strong, we focused on the race, and the team did everything perfectly," said the Russian. Petrov's Renault team-mate Nick Heidfeld, the stand-in for Kubica, finished a lowly 14th. Alonso had got himself caught up in Button's wake as the McLaren went backwards off the line and the Ferrari ran wide into the first corner. The Spaniard slid to 10th but he picked his way smoothly through the field before passing Webber for fourth place. Both drivers were on a three-stop strategy but Webber conceded fourth place to Alonso on the final stop after he ran wide on his return to the parkland circuit. 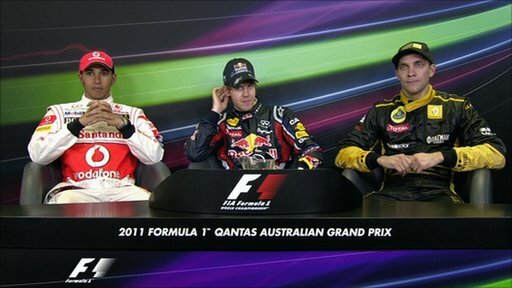 "It was very frustrating, I was pushing as hard as I could but I wasn't getting much back to be honest," said Webber. "I haven't been on the pace all weekend and I need to find out why." There had been a lot of talk about tyre strategy and management in the build-up to the race as this season's Pirelli tyres have been designed to degrade more quickly than 2010's Bridgestones. Most of the field made straightforward two-stop strategies work but Sauber raised eyebrows as Sergio Perez, making a hugely impressive F1 debut, stopped just once on his way to seventh, before his subsequent disqualification. "It was a dream start for me to finish in the points and to have such a nice race," the Mexican said. "To be honest we never thought we could do only one stop, we thought two or three. But I managed the tyres quite nicely, and I'm really happy for the team." Both BBC F1 summariser David Coulthard and chief analyst Eddie Jordan made Perez their driver of the day. Mercedes arrived in Melbourne with high hopes of a podium but their weekend ended miserably inside two laps. Schumacher, who had a puncture at the start, was retired from the race as a precaution before his old Ferrari team-mate Rubens Barrichello added to his misery by ploughing his left wheel into the side of Nico Rosberg's Mercedes, sending him back to the garage for good. "I had a good start but someone knocked on my rear right and there were consequences from that," Schumacher told BBC Sport. "I had an entertaining few laps but the team quite rightly for safety decided that I should come in." Di Resta was pleased after a calmly impressive debut. "I thought it was quite productive for a first race, although I think our speed showed in where we finished, we knew it would be hard for the first three grands prix," said the young Scot. He confirmed he had let Force India team-mate Adrian Sutil pass him twice. "He was on a different strategy. I did make a few mistakes, especially on in-laps, with procedures, and we were a bit optimistic on performance, so had to go with quite a big fuel conserve in the last part of the race." Barrichello was the second driver to serve a drive-through penalty for his move on Rosberg and later had to retire from the race.